There are a ton of childhood games that can be just as entertaining for adults when we play them with our significant others. Grab a basketball, head to a local court, and play a game of Horse. Try to create and match wild shots; shoot it from around the back, through your legs, or maybe from half-court with your eyes closed. The loser can buy Slurpees later. Don’t leave the blacktop before you draw out an insane pattern for Hopscotch in chalk. 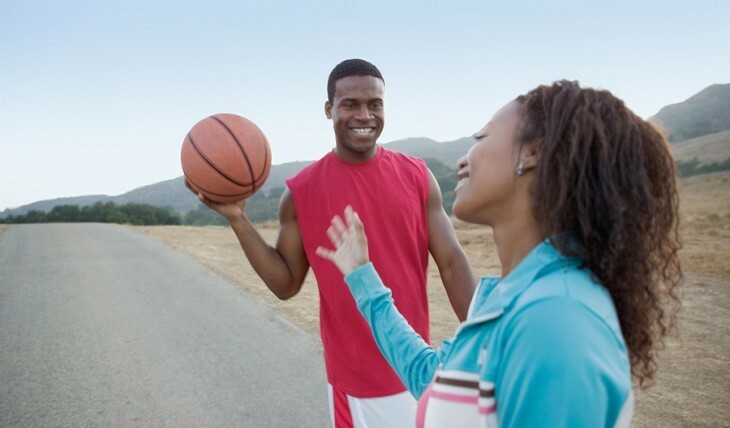 Throw a pebble and see how balanced and agile your partner really is. You’ll both be sure to get a laugh out of each game. The silly fun on this weekend date idea may be exactly what you need after a long week at work. On your walk to get your Slurpee reward, speed it up with some Tag. You can run through yards, weave through buildings, and dash across parking lots. When you’re out of breath, you’ll have the consolation prize of being caught up in your favorite person’s arms. You will, however, be It. Thanks to this expert relationship advice and all of that mad running around, you might discover places in your town you never knew existed, places you can go back to for your next date. When evening hits and you’re back at home, you can pull out some speakers and dance in the cool, spring air. Move and shake as the sun sets, and then slow it down for a romantic song or two. When it’s finally dark, it’s time for some old-fashioned Marco Polo. You don’t need a pool to play this game. Under the cover of night, with your eyes closed, call out and feel around for your beau. You don’t always need to behave like an adult to be in an adult relationship and love. Mixing it up with some kiddish antics can be just the kind of fun you’re looking for, if only for this weekend. Have you played around on an outdoor date? Share your stories below.